“World-Herald editorial: Swift action on judge is warranted” « Hercules and the umpire. As the editorial points out, “Rossiter’s nomination came 21 months after District Judge Joseph Bataillon announced plans to move to senior judge status, and 10 months after the state’s U.S. senators recommended Rossiter to the president.” We need Bob Rossiter tomorrow! The powerful Chairman of the Senate Judiciary Committee, and a Nebraska neighbor, can make a quick confirmation hearing a reality. I hope Mr. Grassley is listening. 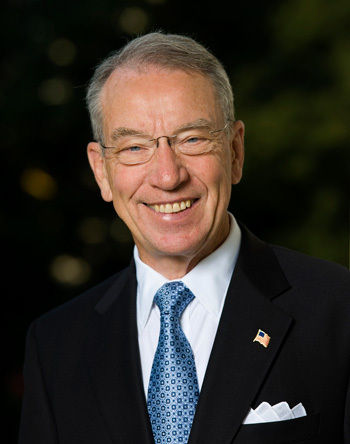 * For reasons only the paranoid understand, my Chrome browser will block this link to the government’s web page on Senator Grassley as “unsafe.” I haven’t taken the time to figure this out, so you may want to use another browser other than Chrome to open this link. Or you may already have configured Chrome to avoid this problem, in which case you may fairly call me an illiterate moron. No need to do so, however. I cop to that without prodding. I’ve already written Grassley on this subject. May his confirmation be swift and painless. Thanks so much. I truly appreciate it. The use of the words swift and senate in the same sentence seems unrealistic to me. Counting on our good friend Chuck to speed this along. Will stop Iowa jokes in consideration of a quick hearing. In 1973, Carly Fiorina’s dad (Joe Sneed) was nominated and confirmed in one week.